Last week I blogged about the new Using your iPhone to Get Things Done micro site that Apple had just released. I also released the list of the Top 10 Paid iPhone Productivity Apps according to downloads from the iTunes App Store. As well as the list of the Top 10 Paid iPhone Productivity Apps, there was also the list of the Top 10 Free iPhone Productivity Applications. These applications are the ones that are listed as Productivity Applications in the iTunes store. The ranking is based upon the number of times that they are downloaded from the iTunes store. So, here are the list of the Top 10 Free Productivity Applications for the Apple iPhone and iPod Touch. I am glad to see Evernote on this list. Evernote is an application that I use all the time and really do find helps me with my capturing of notes, especially voice and photo notes. I do not use any of the others, just going to check some of them out now to see what they are like. The iPhone really has been a hit for me as far as Productivity and their are some amazing apps coming out for it. Do you have a story to tell about any of these Apps? Do you have other Free iPhone Productivity Apps that you use? I would love to hear so please comment. This entry was posted in Cool Software, General Items, GTD General, iPhone Productivity and tagged apple, evernote, iphone, ipod, productivity, things on November 30, 2008 by Andrew Mason. I had as great weeks vacation at Centerparcs with my family. I now feel energized and ready to get back to it. I used my Moleskine and iPhone to their full ability whilst away, making a lot of notes and collecting every thought I had to ensure all my Open Loops were closed. I had to do quite a catch up when I got back as I did not have 3G access on my Mac but I did on my iPhone. My first link for this week is a link to the latest December 08 issue of the Online Costco Connections Magazine. 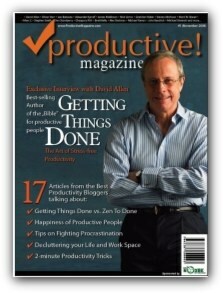 The reason for the link is that there is a great GTD Interview with David Allen on Pages 22 to 25. My second link is from Baron.vc is it is a link about Really Getting Things Done with Remember The Milk iPhone App. Remember The Milk is a cool web and iPhone application and the blog post shows you how the author uses them both to Get Things Done. My fourth link is a link to a post about leaving Things, and moving to OmniFocus. I have not really given Things a proper try yet, as I am too firmly routed to OmniFocus and reading this post makes me glad that it seems my decision is the correct one. My fifth and last link for this week is a link to the iBoughtaMac.com blog about To Do Lists Made Simple. The post focuses on Things as the application of choice. Good contrast to the last link. I am trying to get one more post in tonight, a post covering the Top 10 Most Downloaded Free Productivity iPhone Apps. Wishing you all a great week and I am glad to be back. This entry was posted in General Items, GTD and Productivity Links, GTD General and tagged gtd, iphone, links, moleskine, Motivation, omnifocus, productivity, things, vacation on November 30, 2008 by Andrew Mason. I am going away tomorrow to Centerparcs with my family. I am looking forward to a nice week in the forest spending quality time with my family. Like many people, I work hard and taking time out is quite hard due to the pressures of running your own business. However, bonding and spending quality time with your family is also very important and getting that work life balance is always key. I have four children so spending time with them is one of my main priorities but luckily I am home a lot so get a lot of time to spend with them. Luckily, I have always been able to utilize my vacations as great “think tanks”. I always seem to come out of a vacation more energized than when I went in. Some of my greatest ideas have come out of being away on vacation. I think it is the fact that I remove myself from my daily routine, so my brain is able to focus its thought patterns on other, more creative tasks. Before you go on vacation, I feel that it is imperative that your Open Loops are closed. What I mean here for those of you new to the term Open Loops is that you have to ensure your mind is free of niggling tasks that must be done before you leave. In the few days leading up to your vacation, it is very important to hone your productivity skills in order to complete the tasks that must be complete. I like to prioritize the tasks that must be done before I go away and things that can wait. I do a pre-vacation review and get my task system in place with a clear defined list of actions that I must do in order to go away with a clear mind. I always let people who may be needing me in the week I am away know that I am going to be away. This sets their expectations and removes the worry that you will get something to deal with that is urgent whilst you are away. A very important thing to do is to set your Out Of Office Assistant letting people clearly know that you are away, when you will be back, who they can contact whilst you are away, and what they can do if they need to contact you. Using a system like AwayFind is a fantastic resource for covering when you are on vacation. I have just changed my regular Out Of Office message to state that I am away on vacation with limited access to email, but they can still send me an urgent message through AwayFind if needed. I love to read when I am away. I love biographies and anything which will improve my mind and motivate me. I have just finished reading Tycoon by Peter Jones and I am taking with me this time The Real Deal by James Caan. Book reviews will follow for both these books pretty soon. Books ignite the spark in my brain and help me with my thinking. I normally pick up some little nuggets of inspiration from these books and it is always nice to see how other people made it. I like to read about success, motivation, and also people who are self made entrepreneur millionaires. As I have wrote about before, when I am on vacation with an empty mind, I get my most creative thoughts. Because of this, and also the fact that I am not in front of my Mac all day it is very important to take a good notebook and pen with you. I normally pack a couple of Moleskine’s and a few pens to ensure everything is collected. I always have my iPhone but seem to prefer paper based collection when I am away. It is so important to collect and record these thoughts as soon as they enter your head. Once I return home, I enjoy recording all these into my GTD system to ensure that they are allocated and scheduled for completion when they need to get done. Last but not least, Enjoy yourself! You work hard, and you deserve a break! Too many times we are at work dreaming about being at home, and then when we are at home we are dreaming about being at work. 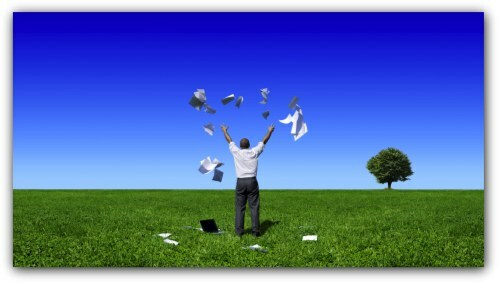 It is important to utilize the time on vacation to recharge your batteries so you can return to the office energized! Well, I will enjoy myself and I know I will have some great productive ideas that will be put to good use on my return. Do you have any little tips and tricks for getting the most out of your vacations? I would love to hear! Thanks, and have a productive week! This entry was posted in General Items, GTD General, Motivation and tagged email, gtd, iphone, moleskine, Motivation, tasks, vacation on November 23, 2008 by Andrew Mason. This week I am linking to five blogs that I have never linked to before. Some of these are established and some are total newbies to Productivity Blogging. Great to see new blogs appearing all the time. If you have a new blog and have some great posts, be sure to let me know and I will gladly link to your great content in my weekly link roundup. My first link for this week is a link to a UK based site dedicated to managing your time. This is a great little site with some great resources. Pretty basic information and the site is Adsense heavy but sill a nice little site. It does appear to be a “Made for Adsense” type of site at first glance but the content does check out to be unique. My second link is a link to the GTD tag from the Blue Knight Blog. The main reason for the inclusion of this blog is the information to be found on Pocket Informant. I used to use Pocket Informant on my Windows PDA and loved it. Nice to see it is still going and people are using it in their GTD and Productivity methodologies. My third link is a link to a Scotch Box Hipster PDA (hPDA). A bit of fun and some good information from this new GTD Blogger. My fourth link is a link to the first Google Android GTD Application Review from the Getting Things Done Blogspot Blog. Now, I have never seen an Android phone but looking at the user interface, I do not think the iPhone has much to worry about! My fifth and last link for this week is a link to a neat little post about taking notes and using MarkUp. Another new blogger that I have never linked to and a blog which does seem to have good resoruces on it. I am going away tomorrow for a midweek break to Centerparcs in Nottingham. Looking forward to a nice break with the family before the chaos of Christmas sets in. May not be many posts this week, 3G coverage dependent. This entry was posted in Cool Software, General Items, GTD and Productivity Links, GTD General and tagged blogging, gtd, iphone, links, Motivation, productivity, things on November 23, 2008 by Andrew Mason. Just had to write a little post about the new Productive Magazine. I had not heard about this magazine until fellow blogger John Kendrick commented about it on one of my posts. The Magazine is brought together by Michael Sliwinski, the guy behind Nozbe, and it is a collection of 17 articles from top productivity bloggers in the format of an online magazine. The first edition also features an interview with David Allen, the author and founder of the Getting Things Done methodology. The first edition of the magazine can be read online by following this link. The content of the Magazine looks great. Cannot believe I missed this but this just shows how much is going on in the Productivity space right now. I have set a goal to try and get an article into the next edition of Productive Magazine so I will have to pull all the stops out and write a killer article that will get accepted by the magazine. I hope you all take a look at the magazine and download it. Looks a great read and thanks go to Michael for putting it all together! This entry was posted in General Items, GTD General and tagged goals, nozbe, productive magazine, productivity on November 22, 2008 by Andrew Mason. 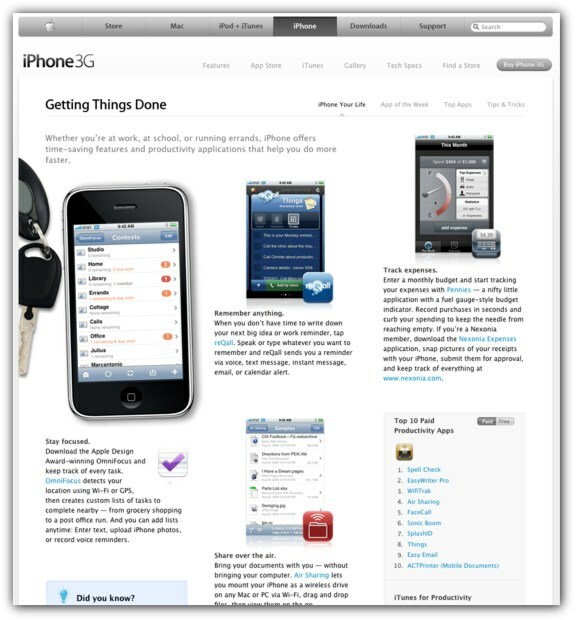 I blogged earlier today about the new Using your iPhone to Get Things Done micro site that Apple had just released. One of the items on the micro site is a list of the Top 10 Paid iPhone Productivity Applications. I am presuming this is based upon data from Apple and download information over a time period. However it is worked out, this is great data from Apple as you can see what other people are downloading in order to use their iPhone and iPod Touch as a productivity device. So, below is the list from Apple along with links to Productivity Apps in the iTunes store. The big shock for me is that my favorite GTD app on the iPhone, Omnifocus, is not on the list!. Maybe the cost of OmniFocus puts people off, and also the fact that you do really need the Mac App as well in order for it to work to the full effect. The category within iTunes for Productivity is quite big and covers a lot of areas. It is however interesting to see which applications are selling the best from Apples point of view. What do you think? Are you surprised by this list of the top 10 Productivity Apps? This entry was posted in General Items, GTD General, iPhone Productivity and tagged apple, gtd, iphone, ipod, omnifocus, productivity, tasks, things on November 21, 2008 by Andrew Mason. Apple have just released a new iPhone Your Life micro site as part of the Apple Website. This is a collection of micro sites that help you fit the iPhone into your life. The site has five further micro sites. As you can imagine, the Getting Things Done Micro Site is of real interest. This GTD Micro Site covers a lot of the main GTD related apps such as OmniFocus, Evernote, and reQall. All apps which I fully recommend for anybody looking to get the most out of their iPhone or iPod Touch as a Productivity Tool. On the page they also mention some great Podcasts and material that is available via iTunes including the Getting Things Done audio book by David Allen. I have listed to the Audio book a few times and it is great as a recap whilst you are traveling and otherwise wasting valuable time. Check the site out and I hope you find it useful. I am going to do separate posts with the Top Paid and Free productivity apps, according to Apple. This entry was posted in GTD General, iPhone Productivity and tagged apple, evernote, gtd, iphone, ipod, omnifocus, productivity, reQall on November 21, 2008 by Andrew Mason. BlackBerry fans have been eagerly awaiting news of the newest model from the pioneering web phone company which develops the units. The Storm model has just been released in the UK with North American distribution scheduled for less than a week from now. 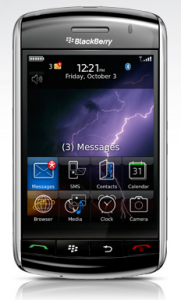 The BlackBerry Storm is an updated model of the popular gadget with brand new features which seek to provide some solid competition for Apple’s iPhone. Aside from the updated touch-screen features, Storm is also outfitted with a handful of additional updates meant to draw existing BlackBerry customers to the new model. A remodeled digital camera/camcorder has been fit into Storm along with a re-imagining of the keyboard functions which made BlackBerry so prolific in the past. Users are able to choose between a traditional QWERTY layout or the updated SurePress and multi-tap, cell-phone style options. While some users remain hesitant about adopting the BlackBerry Storm and it’s new, touch-screen approach, the company has added subtle effects (such as clicking sounds when keys are pressed) in order to keep the fan-base satisfied. Generally superb reviews and years of development should help the wary ease their concern about picking up a BlackBerry Storm. The web phone is certainly a fantastic choice for those in the market for a mobile device which easily (and affordably) combines communication, internet access and fun gadgetry into one sleek looking package. Check out the official web page of the BlackBerry Storm. It will be interesting to see what productivity and GTD applications come out for the Storm. Of course I will be reviewing them here when they do come out. This entry was posted in General Items, GTD General, Productivity Gadgets and tagged blackberry storm, gadget, iphone, productivity on November 20, 2008 by Andrew Mason. 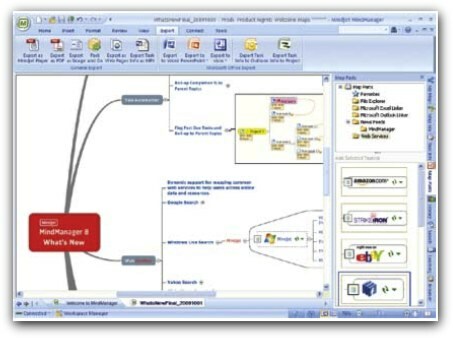 Mind Manager, what I consider to be the best Mind Mapping application has just upgraded to version 8. At this point this upgrade is only for Windows users so if you are a Mac user like me, you have to stick with the version 7 for Mac until version 8 comes out. The Windows version of Mind Manager has always been a lot more feature rich than the Mac version and I have found myself using the Windows version in VMware when I have needed to use some of the more advanced export features of the Windows Mind Manager application. So, what is new in Mind Manager 8? Communicate your vision and ideas with the world by transforming your map into a fully interactive Adobe PDF file. Or publish it as an interactive Adobe Flash file to a Web page or blog. Recipients do not need to download and install any software – most desktops are already equipped for consuming these standard file formats. Get a quick overview plus ongoing progress on all project tasks—automatically. Visual cues and status indicators allow you to quickly determine the status of critical activities. View the ripple effect of any changes to a map and even run “what if” scenarios to see the resulting outcomes. View and edit attached Microsoft Word, Excel, Project and PowerPoint files within MindManager. No need to disrupt your focus by constantly switching between applications – it can all happen from your map. Please see MindManager 8 system requirements for details. Content Fully leverage the incredible information resources of the Internet by initiating Web searches right from a map. Real-time search results will appear whenever you view your map. Build your own Web service to add information from your company’s information systems. View Web pages and Adobe PDF documents without leaving your map. You’ll retain your train of thought by staying focused on work at hand. Display real-time information in your map from databases, Excel spreadsheets, CRM systems and other company resources. Just imagine how much more productive and focused you’ll be with your most critical business data right at your fingertips. MindManager now lets you search through your maps and all attached documents with ease. Or use one of today’s popular desktop search applications. Rest easy, knowing any bit of information you may need is just a quick search away. Enjoy fast access to all Mindjet Connect features and management utilities. Quite a few cool features in there. What interests me the most and will be the reason I upgrade is the addition of the MindJet player. I can now create Mind Maps and embed them into a website. This is going to be awesome from a usability point of view, especially for my Mind Mapping Certification site at www.mindcert.com. You can see an example of the MindJet player by following this link to the MindJet website. The sample map shows you some of the features of Mind Manager 8. This entry was posted in Cool Software, General Items, GTD Applications, GTD General, Mind Mapping and tagged MindJet, mindmanager, productivity, tasks on November 19, 2008 by Andrew Mason.